Texas ranks among the highest for property taxes across the U.S.
With the House of Representatives debating the property tax bill, lets take a look at how Texas compares to other states. AUSTIN, Texas — The House of Representatives is set to debate House Bill 2, a bill designed to slow the growth of property tax bills, on Monday in session, after failing to do so on Thursday, April 11. Members of the House were seemingly ready for a long debate. The clerk and the House even printed out copies of the 180 amendments that were pre-filed on House Bill 2. The Senate's version of the bill, SB 2, was voted out of committee during session back in February because there weren't enough votes to get it passed. Those opposed believe passing the property tax bill would hurt the ability of cities, counties and schools to fund critical services. So where does Texas line up with their property tax laws compared to other states? According to the Tax Foundation, property taxes paid as a percentage of owner-occupied housing value in the state of Texas is 1.62 percent, which ranks seven out of the 50 states. This rank means Texas has one of the highest property taxes in the U.S.
Texas, among other states like New Hampshire, relies heavily on their property taxes rather than other tax categories, like sales tax for example. 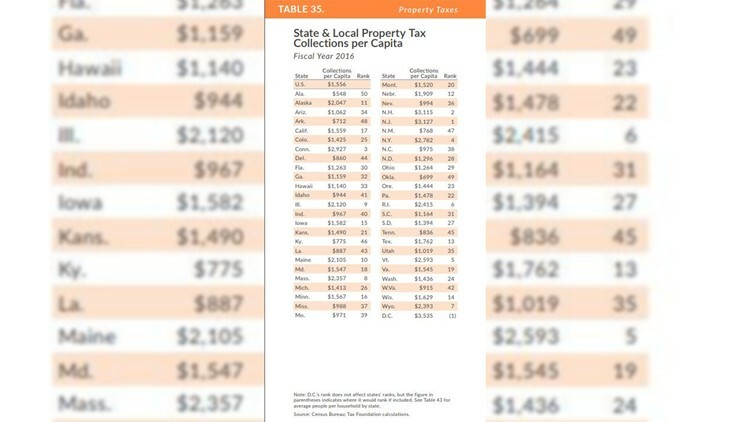 For state and local property tax collections per capita, Texas pays $1,762, according to the Tax Foundation, ranking Texas at 13 out of the 50 states for highest property tax. Two other studies ranked states based on their property tax rates and put Texas in the top five and three of the highest property tax rates across the U.S., respectively.